Pico Union Project is excited to announce a six week residency with multimedia artist Sharon Kagan. From March 9 through April 20, Kagan will be honoring Spring as she works to create a communal painting that celebrates and challenges conceptions of rebirth and change. Kagan has spent her artistic career mastering numerous mediums ( from painting to performance and video art). She utilizes each medium as a way to speak about and cope with her experiences. Her most recent body of work will influence the community painting by combining fine art painting and photography with the craft of knitting. 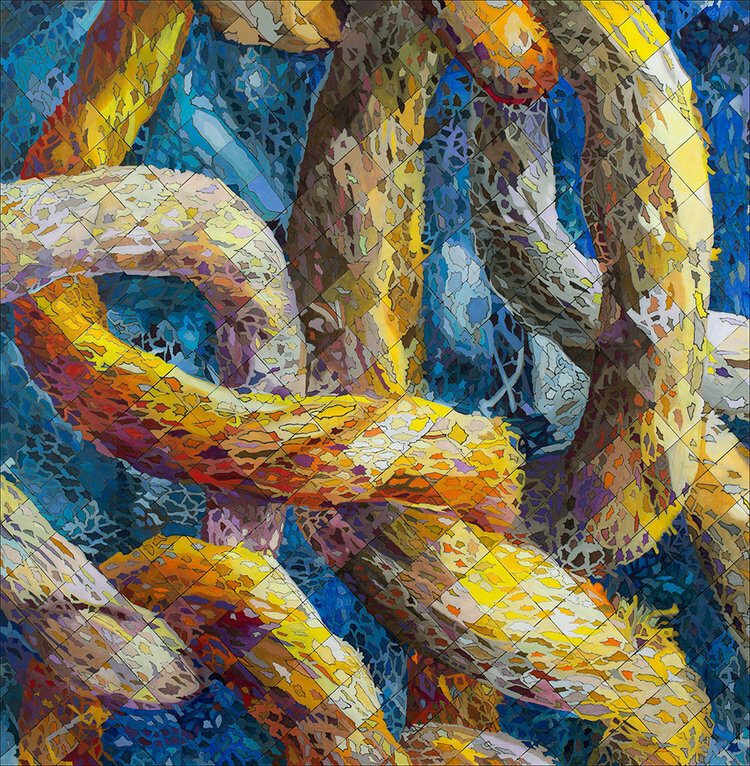 By knitting hemp string and rope, photographing it, and drawing on an enlarged image, Kagan pulls her work together, untangles it, and creates a chance for both viewers and participants in the painting at Pico Union Projects to reflect on their experiences and the messiness of life. Sharon Kagan ill be in residence at Pico Union Project from March 3 - April 9, 2017. She will be present at all Pico Union Project events and host a reception on Thursday, April 13 from 6-8pm. Sharon Kagan is a multimedia artist raised and residing in Los Angeles. She received her BA in Painting, Sculpture, and Graphic Design from UCLA and her MFA in Sculpture from Otis Art Institute. Kagan was initially discouraged from being an artist, taking her first art class while enrolled in her undergraduate studies, ultimately falling in love with creating interactive sculpture works. She worked with Judy Chicago between her degrees on the “Dinner Party,” a seminal feminist installation project that continues to resonate with artists and women today. Kagan also founded the Creativity Center in Santa Monica that remained open from 1986 to 2012, focusing on the development of the personal creative vision of both artists and non artists. While sculpture is her first love, Kagan also works with installation, video, performance, painting, drawing, knitting, and embroidery, using each medium to explore her identity as well as the ever changing cultural landscape of Los Angeles. The Pico Union Project is dedicated to the Jewish principle to “love your neighbor as yourself.” It elevates this teaching into practice in a historic building by bringing diverse cultures together through song, story, art, food and prayer. Pico Union Project is a multi-faith cultural arts center and house of worship founded in 2013 by visionary recording artist, composer and musician Craig Taubman. Pico Union Project aims to help invigorate the community of Los Angeles and reflect the Jewish value of being a light to all nations.